Yes, they’re ridiculously expensive here, especially on the West Coast. Although I ran out of room in this year’s winter garden, I hope to grow them next year. I think I’m coming down with what you just had, so I guess I’ll have to go out and invest in some leeks. Are those leek furry? The ones we get in Australia are smooth as a baby’s bottom! A bunch of leeks cost about $2.59 (bunch=3 or 4 stalks). The Potato Leek Soup Recipe looks delicious! 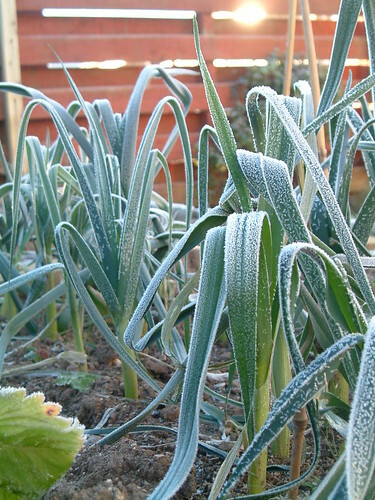 Dominic … I don’t think the leeks are furry … I think they’ve got frost on them!!!! I don’t think they’re wildly expensive. I wish we could grow them, though! I love’em on pizza. 🙂 Hope your feeling better soon. Working with kids is like handling petri dishes. Yep – they’re totally more expensive, and they have nowhere NEAR the flavor they have over here. Plus: they don’t have anywhere near the sulfur content in the States than they have over here (speaking as the spouse of someone who’s allergic to sulfur compounds). The leeks in the US are … weak. Totally weak, utterly different than the leeks over here. I’ll make this tomorrow (or may be thursday as I’m closing up shop tomorrow). But God be damned if I’m going to peel my potatoes. What’s the point if you’re going to liquidize them anyways? Shame on you LGA. Show me some skin. Leeks are about $2/lb in Vancouver (Canada). Red onions would be about $0.70/lb. The leeks are very mild flavoured, almost anaemic. 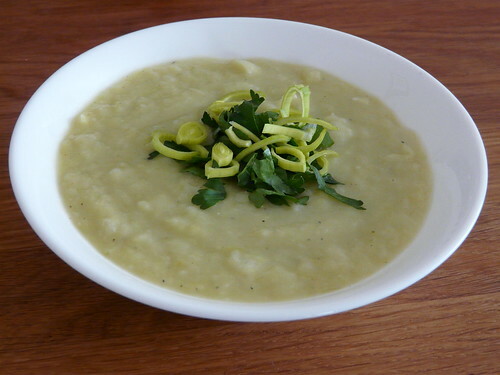 Sorry to hear that you’re not feeling well, but Leek and Potato soup is almost worth getting sick for. Two Barking Dogs – OK. So more expensive than here but not extortionate. Kim – The people that owned Marco before me were into showing dogs so Marco was VERY used to being groomed by the time we got him. He doesn’t love it but he doesn’t wriggle. Johanna – It’s an old photo from a couple of years ago. I like it very much though. Alex – You are correct. That comment did make me giggle though. Leslie – It really is. Feel like wearing a mask some days. DaviMack – It’s the texture I love. So silky when cooked. Andrew – Ah, good point. Skin is good. Lisa – That’s a pity, indeed. They tend to be really tasty here. Very popular veg in Scotland though. I purchased 4 leeks yesterday for $2.99 each, here in Florida.